For the second week in a row, Tony Smeeth's side were left to rue errors and missed chances, as UCD claimed a hard-fought 23-23 draw. 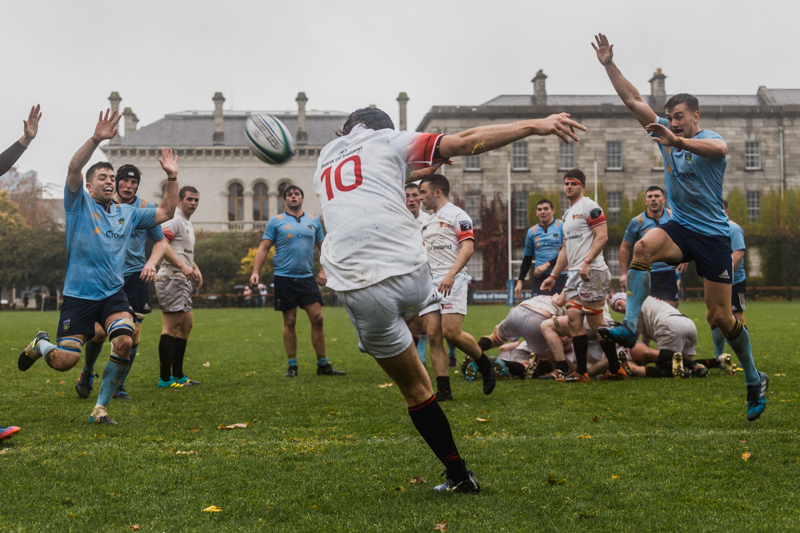 Despite challenging conditions in College Park yesterday, Dublin University Football Club (DUFC) and University College Dublin (UCD) braved the elements as they played out a 23-23 draw. DUFC entered the game holding bragging rights following victory in last year’s Colours and were searching for a first win of the season following last weekend’s heartbreaking defeat at the hands of Garryowen on the season’s opening day. The early stages of the game were characterised by handling errors on both sides caused by the testing conditions, and penalties were the order of the day as UCD were pinged repeatedly in the opening minutes. Trinity took advantage of UCD’s indiscipline and rushed into an early 6-0 lead as out-half James Fennelly punished the visitors. However, UCD grew into the game, with the Trinity defence withholding serious pressure at times to keep the Belfield side scoreless. The visitors refused to be deterred, and there was an air of inevitability when their pack crashed over the line, with full-back Conall Doherty adding the extras to give his side a 7-6 lead. With half-time rapidly approaching, DUFC captain Colm Hogan seized the initiative as he outpaced a scrambling UCD defence to latch onto a Fennelly kick, before crashing over the line to give his side a 13-7 lead. Unfussed, UCD narrowed the gap with a well-taken penalty to three points between the sides at the break. There was no let up in the weather and the second half dawned with conditions just as miserable as the first. UCD began to find their groove early in the second half, and only some superb defensive play from DUFC prevented them from taking the lead. Despite UCD’s dominance, however, it was DUFC who found the opening score of the half. Superb interplay in attack allowed full-back Rob Russell to unleash Bart Vermeulen, the prop making no mistake as he touched down directly beneath the posts and gifted Fennelly the simplest of conversions. However, as the rain eased off, UCD took control of the game once again and began to pile the pressure on the DUFC defence. Having slotted a penalty, UCD quickly followed it up with a well-worked try. A subsequent penalty narrowed Trinity’s lead to 23-20 heading into the final moments. UCD continued to batter the Trinity defensive line, and an error by the home side gave the visitors an opportunity to equalise from the tee, which they duly took. Despite a chance to steal a win in the final minute of the game, Rob Russell missed his penalty, and UCD departed College Park with a hard-fought draw, undoubtedly leaving Tony Smeeth’s side rueing missed chances for the second week in a row.